※Kids age 6 and under are free! /Parental guidance is required for children under the age of 14. ※Door tickets will be available from 18:45. The Australian band, Vaudeville Smash, enjoys playing music that others love to hear! Blending funk, disco, pop, and soul, their enthusiastic Melbourne hometown fans caused a sell-out at the Australian Open. As well, they were considered the "band to watch" at St. Kilda Festival. In 2011, Huffington Post gave them rave reviews after their SXSW performance. 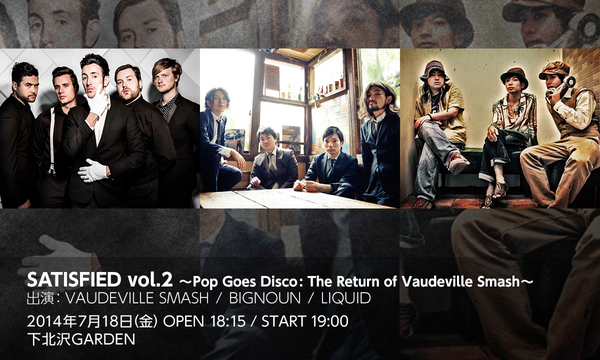 They return to Japan for the 2nd time this July to play Sapporo Jazz Fest, and Satisfied Vol.2 at Shimokitazawa GARDEN.